BEST PRICE GUARANTEED for 2019 – find it cheaper and we will beat it – contact our reservation team today – we are open 7 days. 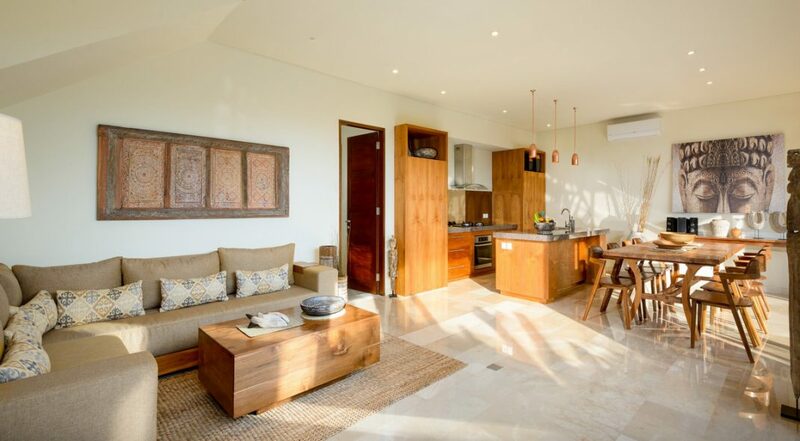 Villa Sophia is a modern 4 bedroom Legian villa featuring contemporary design and minimalist furnishings in tasteful earthly tones. 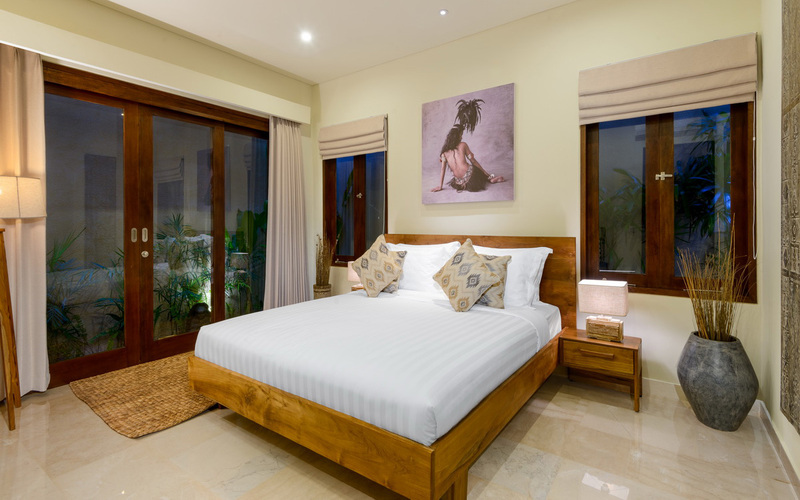 Newly constructed, the villa features four spacious en-suite bedrooms and its open plan design makes it highly functional allowing guests to enjoy a tropical outdoor setting from the confines of the main living area. 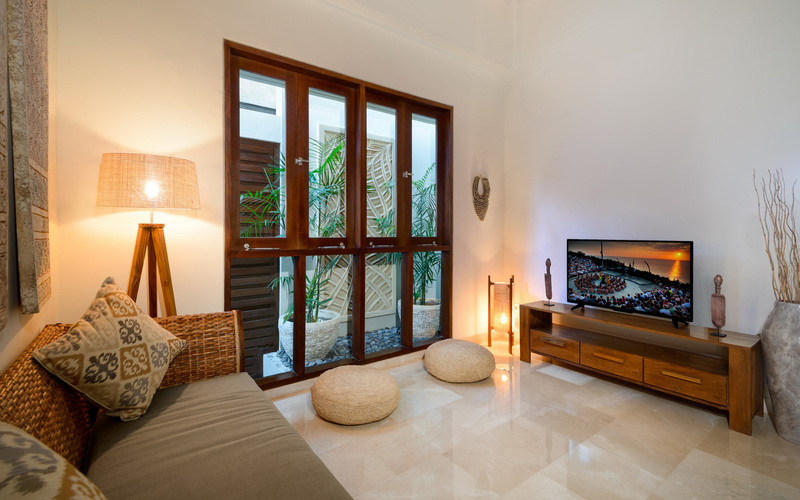 Located just one block back from the sands of Double Six Beach, guests can easily walk from the villa to explore both Seminyak to the north and Legian to the south. The immediate area is packed with shops, cafes, restaurants, bars and great beach options, perfect for an active family or group of adventurous friends. 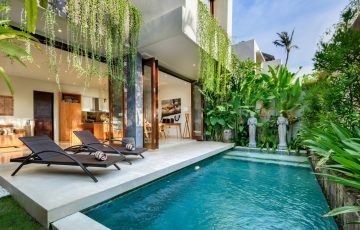 The villa makes smart use of space both indoors and out, a generous sized pool is surrounded by high walls and abundant tropical palms and plants flank the pool. 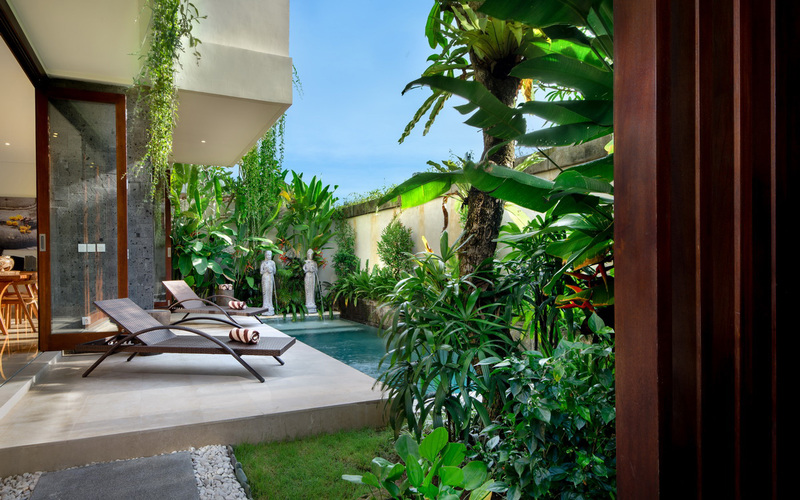 Two water features spill fountains into the pool at one end adding a calming effect while the pool deck houses sun loungers for those wanting to bask in the warm tropical sun. 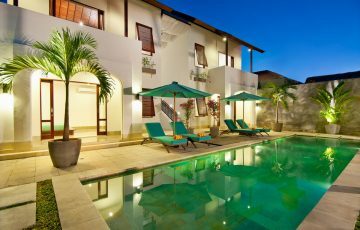 The pool will be a welcoming respite after exploring the local area doing some shopping or spending a few hours at the beach with the family. 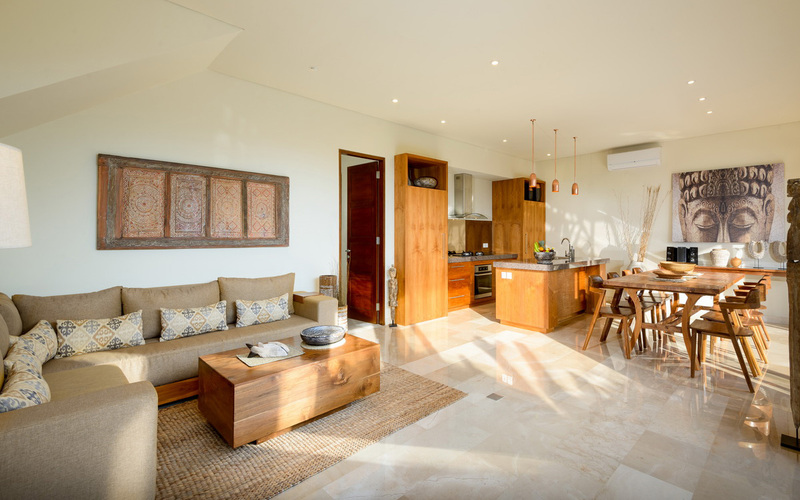 The main downstairs living area is fully air-conditioned and very tastefully decorated with carefully chosen furnishings, the mix of natural timbers, wall art and marble flooring marriage perfectly. 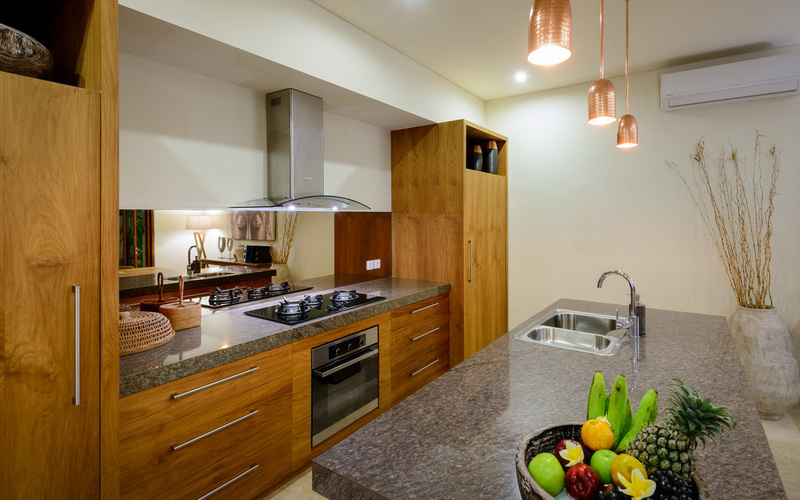 The kitchen is fully equipped with an oven, stove top, plenty of appliances and features lovely granite bench tops and a great breakfast bar. Guests can open the large folding doors to the pool deck to enjoy the outdoor setting or keep them closed to enjoy air-conditioned comfort. The solid wood dining table seats 8 comfortably and it is the perfect setting for relaxed entertaining. For a quiet evening in, head upstairs to enjoy a movie on the flat-screen TV in the media room, the perfect place for some R & R.
The bedrooms are very spacious and all feature deluxe king-sized beds. 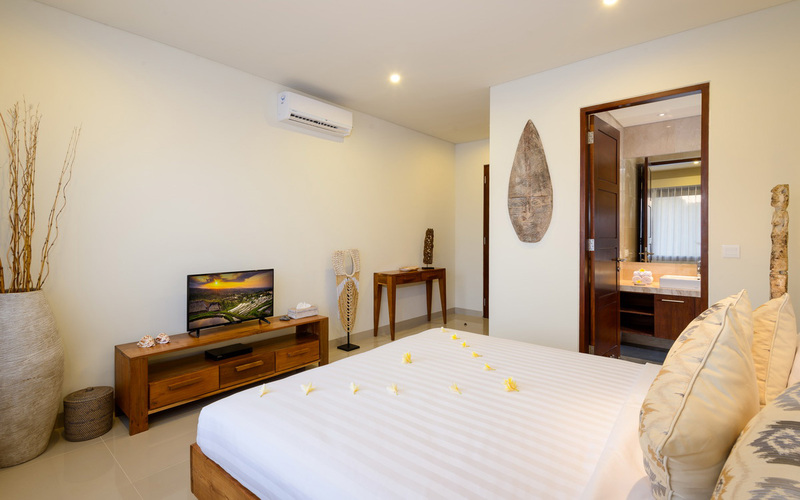 All bedrooms provide flat screen TVs, DVD players and are fully air-conditioned with the option of opening the windows to allow the fresh sea breeze to filter through. 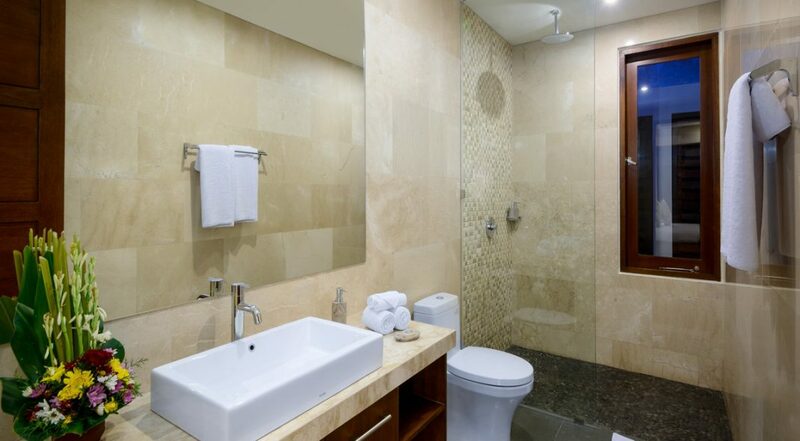 The master bedroom offers a stand-alone soaking tub and the other en-suites feature rain showers. 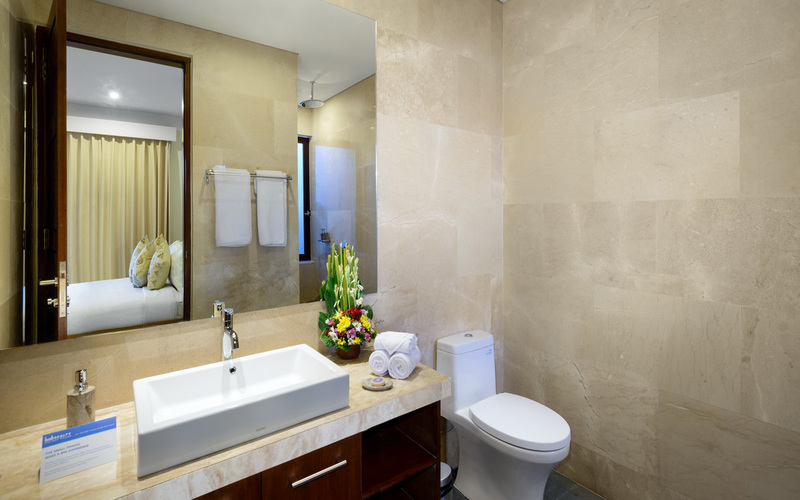 Beautiful tiling, marble flooring and rich timbers make these en-suites an enjoyable bathing experience. 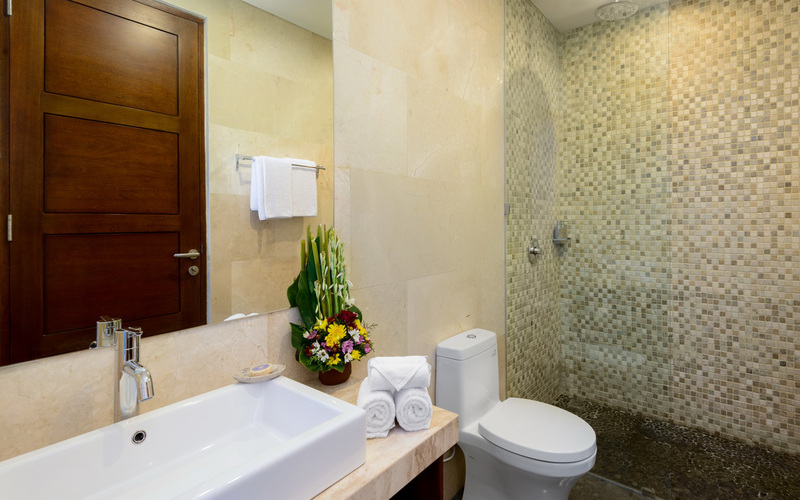 The friendly staff at Villa Sophia will make your stay as comfortable and convenient as possible. The villa manager/butler makes sure the villa is cleaned daily by the housekeeping staff and will serve you daily breakfasts upon request. 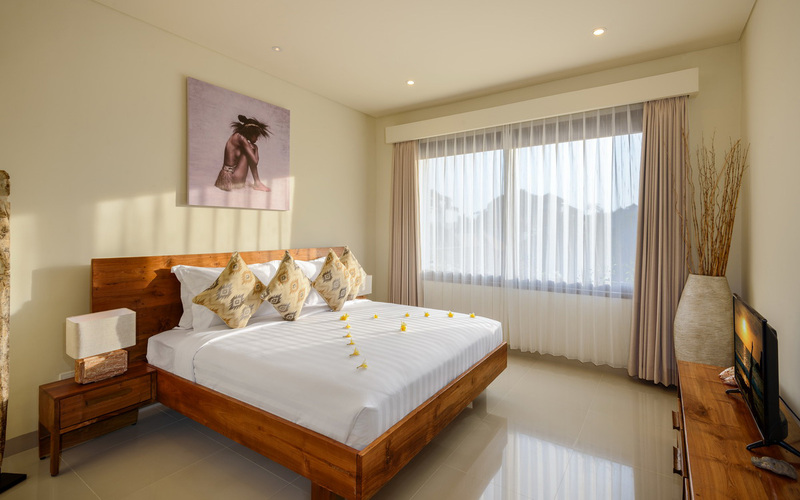 If you require any assistance with reservations, transport services or maybe just some grocery shopping, the villa manager is on call to assist. There is night time security to ensure your safety. 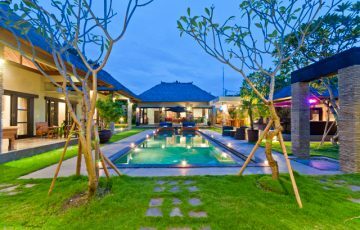 Guests at Villa Sophia are right in the thick of the action, if you like shopping, restaurants, cafes and some nightlife then this is the place to stay. 66 Beach is just a few minutes’ walk from the villa with the Cocoon Beach Club and 66 Hotel. Head south and you will come to the Y Bar, great for watching live sport and the beach at Padma Hotel. 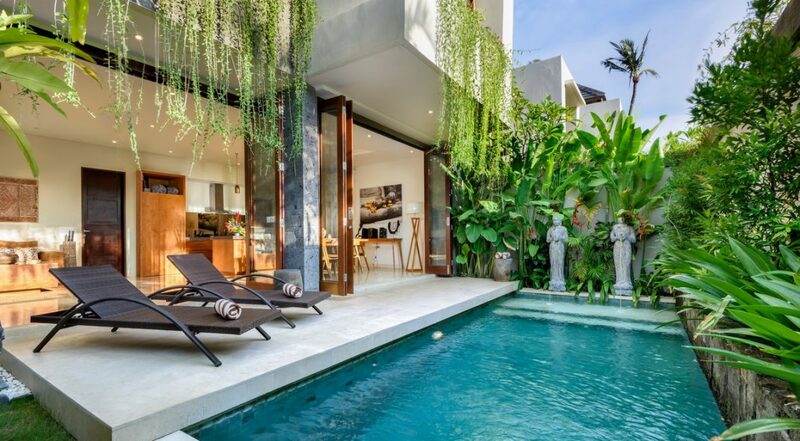 Whatever it is you like to do on your Bali holiday, it’s all right on your doorstep at Villa Sophia. 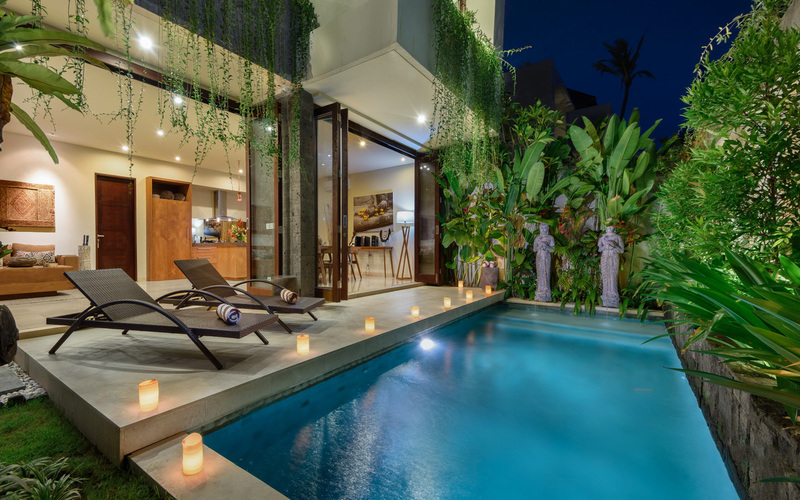 If you would like to see other 4 bedroom Bali villas in this price range or other Legian Villas please contact our reservation team or browse this website. 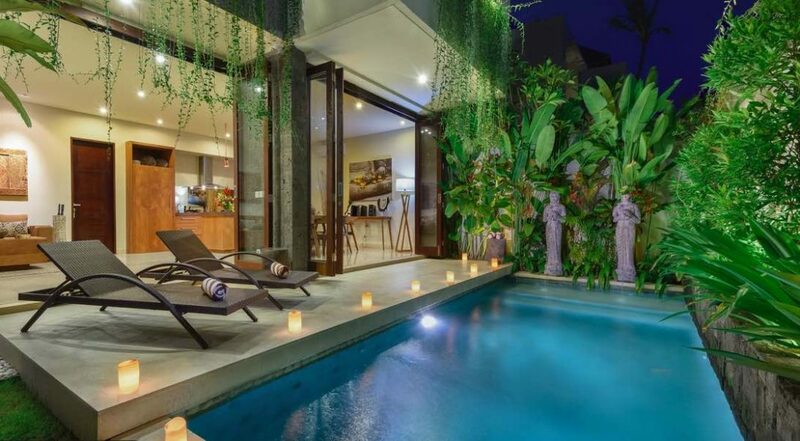 This is a popular Legian villa so please book Villa Sophia well in advance, especially if your planning a trip to Bali during the Australian school or public holidays. Great price and a fab location made this villa a winner! Came here for a week with the family and loved every moment. 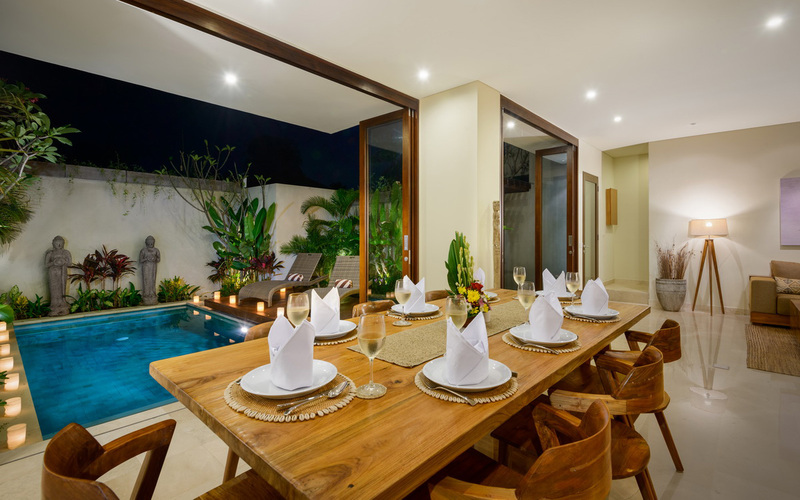 Easy access to tons of restaurants in Legian and lots of shops. 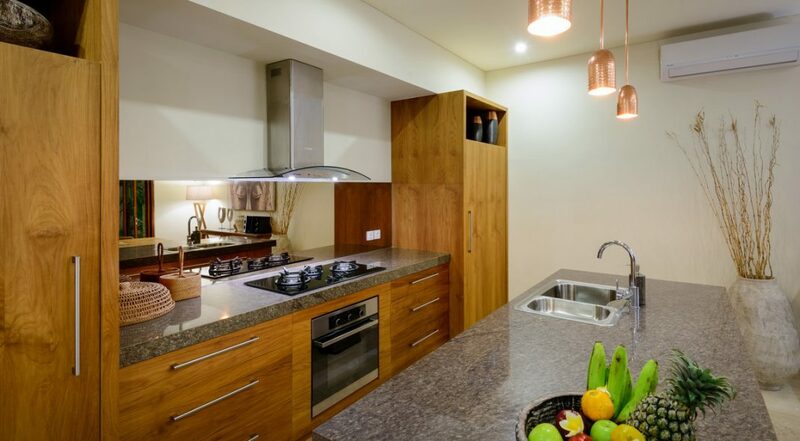 Neat and tidy villa with ample room for the kids. Well worth a visit! Loved the Legian location as this was very handy for taking the kids out at night to restaurants. 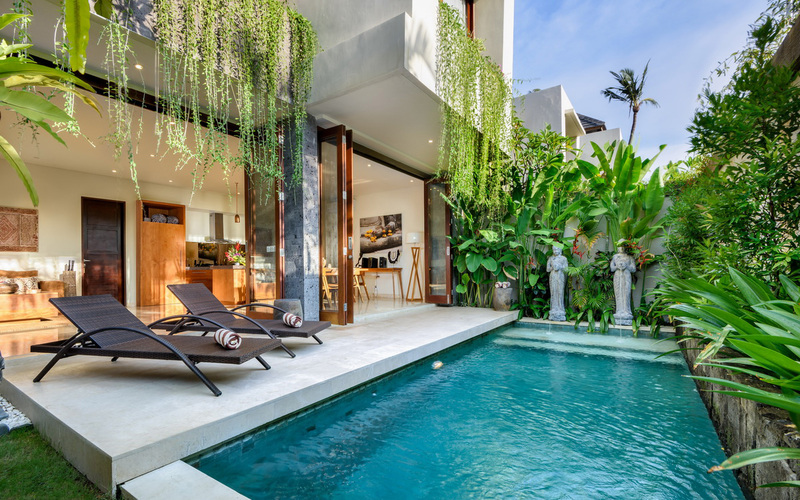 Villa was stunning and was perfect for our week in Bali. For the price and location this villa is amazing. Planning to come back again. 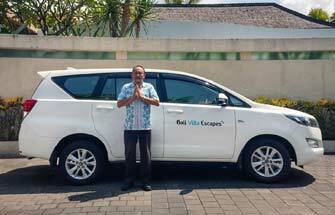 We regularly travel to Bali and love staying in villas. Villa Maria is that good that this is our third stay here. Seriously we just can't get enough of this place. 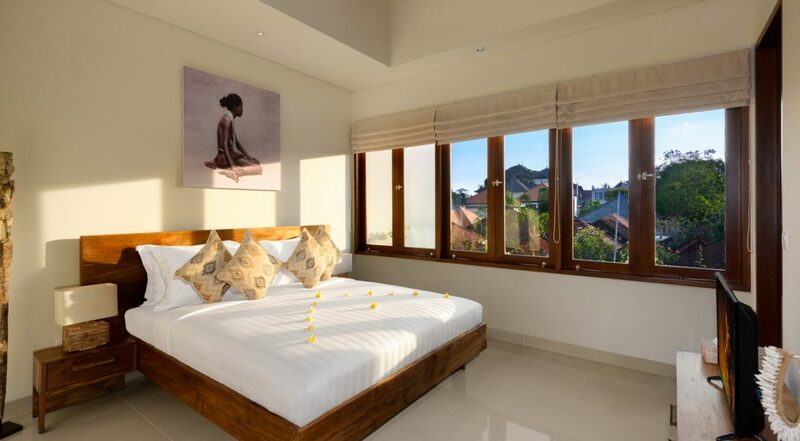 It's got a fab location and is really clean and very modern and we love the fact that we can easily get about in Legian and be at the beach in less than 10 minutes. Price wise it's also really worth consideri8ng everything that's thrown in. 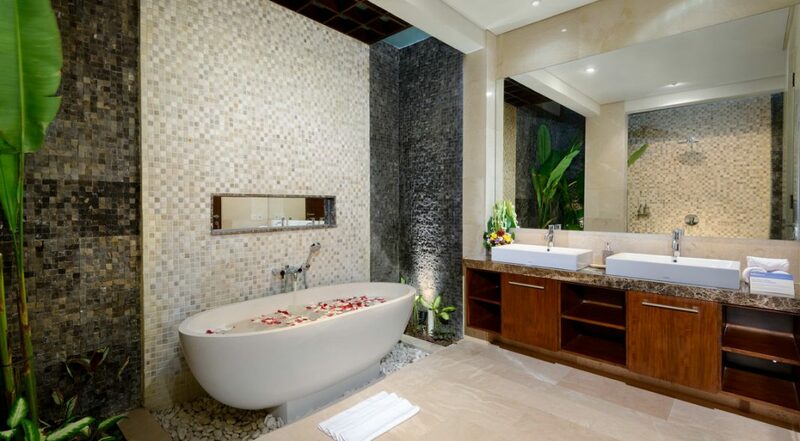 Privacy, swimming pool....what more could you ask for? Im giving it a 10 out of 10! Our group of 7 stayed here for a fab week. Cleaned every day, the food was tasty & Kedek the head butler was the absolute BEST!! Awesome pool, great times and we are definitely booking this again. I wanted to send my appreciation to you and your manager for the response I received from my email whilst to you whilst staying at Villa sophia. I also wanted to send my appreciation and thanks to Kadek our butler for his caring and friendly manner in which he looked after us. Nothing was ever too much for him, he organised restaurant bookings for us cooked us some lovely breakfasts, organised tours even organised a birthday cake for me at the villa. I cannot tell you how much this meant to me. 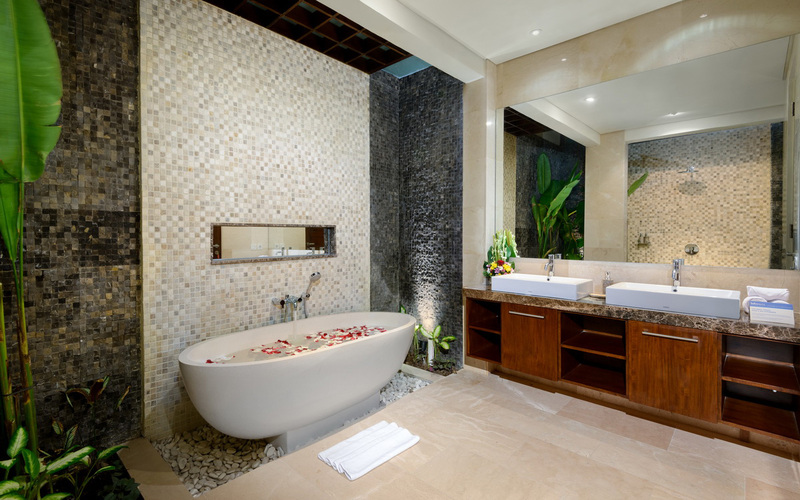 I will definitely be recommending your villa's to all my friends and family. Please pass on my appreciation to your manager and kadek for the outstanding service we received. Loved being near the beach. 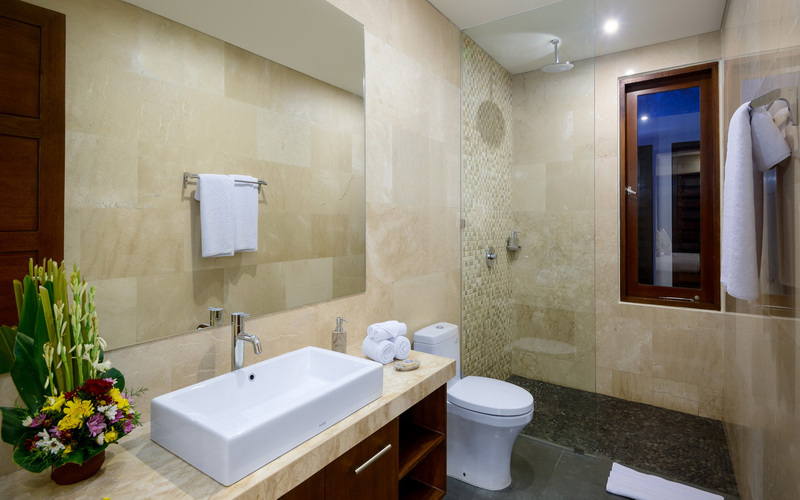 Clean villa with fantastic staff and ultra quiet. Tanks to everyone at Sophia for making us feel so happy.